Acquiring leads is the goal of the gated offer, but how do you acquire buyers? Remember that the key to success in digital marketing is the sequence of the offers you make to new leads and customers. The best way to acquire buyers is by making an offer at such a deep discount that it is difficult to refuse. A deep-discount offer is an irresistible, low-ticket offer made to convert leads and cold prospects into buyers. The goal of a deep-discount offer is not profit. In fact, selling deep-discount offers may come at a net loss to your company. Offering deep discounts may therefore seem counterintuitive, but the goal of this type of offer is to acquire buyers. Deep-discount offers change relationships; they turn a prospect into a customer, and that’s a big deal. After a prospect makes a successful purchase with your company, she is far more likely to buy from you again. Deep-discount offers bring you one step closer to achieving your goal of converting a prospect to a repeat buyer and possibly even a raving fan. As the name suggests, physical premiums are physical products. Offer something that your market desires and discount it deeply. DIY Ready, a company in the DIY and home décor space, offers a $19 bracelet kit for free. 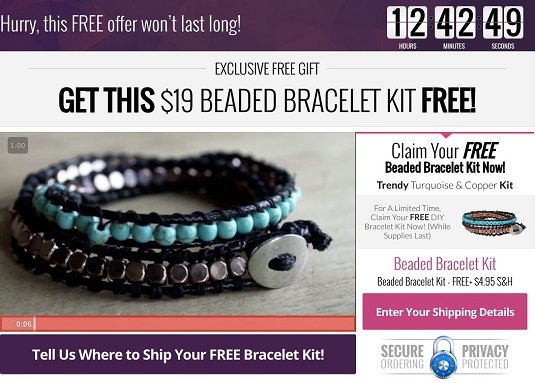 The new customer need only enter his or her credit card to pay for shipping and handling to receive the bracelet kit. This is a physical product that do-it-yourselfers find highly desirable. This image demonstrates what this physical premium offer from DIY Ready looks like. A “Free + Shipping” offer is a typical deep- discount offer. A physical book can make an excellent deep-discount offer. Books have an extremely high perceived and actual value. If you need to establish authority and trust with your market before making more complex or higher-ticket offers, the book is a great deep-discount offer to employ. Consider offering the book at a steep discount, or free plus shipping and handling. Although a physical or digital book isn’t recommended for generating leads, it’s a highly effective way to convert prospects and leads into customers. Remember, the objective of a deep-discount offer is to change the relationship with a lead or prospect and turn the person into a customer. webinars are one of the most versatile offers available to digital marketers. You can conduct free webinars to generate leads, plus you can offer a webinar as a product. Remember that when you’re charging for anything and particularly a webinar, you should deliver value beyond what you’ve charged to attend. When employing a webinar to serve as a deep-discount offer, you may not want to use the term webinar in your offer. People generally associate that term with something free. Consider calling your deep-discount-offer webinar a teleclass, online training, or boot camp instead, and it can be prerecorded or held live. Software and application plug-ins are effective deep-discount offers because software saves people time and energy, so these are highly sought-after commodities. When you use software as a deep-discount offer, the deep discount price is likely to cause a “buying frenzy,” resulting in a highly successful acquisition campaign. If your business has a high-dollar product or service, you can take a small piece of that product, also known as a splinter, and sell it à la carte. The key is to offer a piece of your service that can stand alone at an incredibly low price. An example of a company that uses this approach is Fiverr, an online marketplace that offers tasks and services starting at $5. 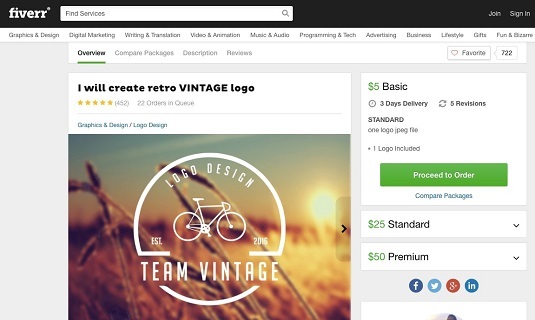 This image shows one of these Fiverr services, which include creating business logos. This is an excellent example of offering part of a highly sought-after service at a deep discount that will help turn a lead into a customer and can ultimately lead to more sales. After a person has bought from you, he’s likely to buy from you again. Through Fiverr, larger services can be splintered into smaller, single projects. Because deep-discount offers are low priced, low risk, and highly desirable, they help your leads overcome doubt about your business or product. Less monetary risk is involved for the leads, so they’re willing to take a chance and become customers. A “little victory” is something that helps inspire your leads and gives them confidence that they can accomplish whatever solution or goal you’re offering, as well as the confidence that your product or service will help to get them there. A little victory gives your prospects hope and a taste of achieving the whole thing — of making it to the other side of the tunnel, so to speak. Keep in mind that little victories are usually quick to achieve and help deliver value to your customer. For instance, if you’re in the fitness world, you can offer your seven-day juice cleanse at a deep discount as a deep-discount offer. When describing the offer to potential buyers, you state that completing this juice cleanse is the hardest part of your program — because getting started is often the hardest part. If they can get through your seven-day cleanse, they’ll know that the toughest part is behind them. As you go through your products and services to determine which will make the best deep-discount offer, ask yourself what little victory this product or service can provide your customers. Brainstorm how it will give them hope, how it will help to get them over the hump of self-doubt. Helping your customers see that success is possible not only for the smiling customers in your testimonials but also for them, personally, will help make your offer more potent and enable you to build positive relationships with your newly acquired customers.